FRYSZTAK: with Glinik Dolny, Pulanki, and Twierdza, a town in Jaslo county, located at 49 degrees 10 N and 39 degrees, 4 East from Ferro [*by modern reckoning 49 degrees 50, 21 degrees 37], 19 km. 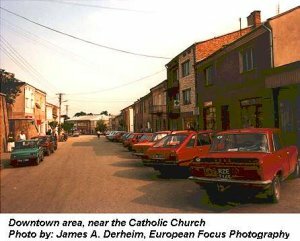 From Krosno, with an area of 1,558 morgs; 134 houses, 590 male inhabitants and 607 female, for a total of 1,197, of whom 416 are Roman Catholic and 779 Jewish. It is the site of the county court, a notarys office, a military police post, post office, deanery office covering 6 parish, and a parish office. The most ancient trace of this parish is to be found in the work "Liber retaxationis dioecese Cracoviensis de anno 1527" [Krakow Diocese retaxation Register for the year 1527]. 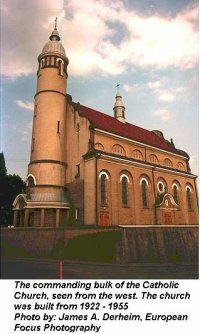 The church is wooden, its date of construction unknown; it is dedicated to the Birth of The Blessed Virgin.